The Hunter Douglas range of interior wood ceilings offers an unrivalled range of wood finishes and natural tones that will produce a breath taking finish to your ceiling project. All of our wood finishes possess their own characteristics. This uniqueness gives the designer the opportunity to create a stunning design to any ceiling void. Our interior wood ceiling are created using wood of various tones shapes and sizes to create a stunning and warm look. With a range of solid and veneered woods available, we can create an architectural masterpiece, that gives a real wow factor to any environment. There are a variety of wood ceiling variations available. Our ranges include linear wood, grill ceilings and wooden ceilings created from tiles and panels. Please browse our full range to fully appreciate the extensive designs we can create. At Hunter Douglas we understand the importance of acoustics. 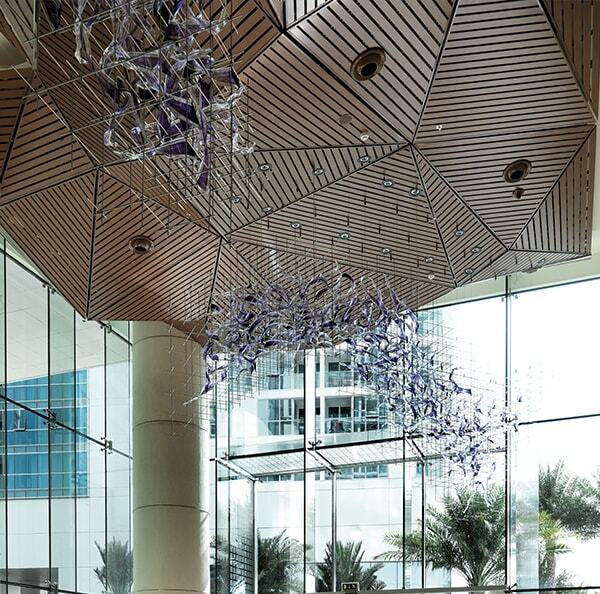 This is why all of our interior ceilings are created to offer the best acoustic performance possible without degrading the overall aesthetics of the ceiling. WHY IS ACOUSTIC SO IMPORTANT? The acoustic comfort in an office space, school or public building contributes to our well being as poor acoustic performance can affect health, communication, safety, productivity and learning. 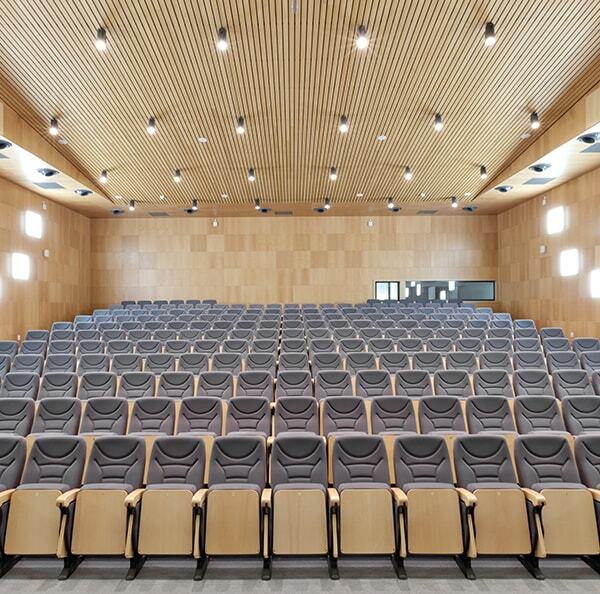 Hunter Douglas Architectural high performance acoustic ceiling products are the best solution to deliver outstanding acoustic performance, comfort and an aesthetically pleasing environment. Our veneered systems are available in over 40 veneer finishes to create the ideal ambiance and feel. Standard panels are treated with a transparent lacquer, but if a special look is required, special varnishes, staining or paint finishes can be applied. It is also possible to slip-match or miss-match sheets and depending on how the veneers are matched, a significant design can be created. Our focus on quality ensures the highest standard of production processes, material, machinery and finished product. The superior durability of Hunter Douglas products translates into lower costs during the life cycle of the product. Due to a special treatment of the wooden panels, some wood species are perfectly suitable for humid areas, such as swimming pools. 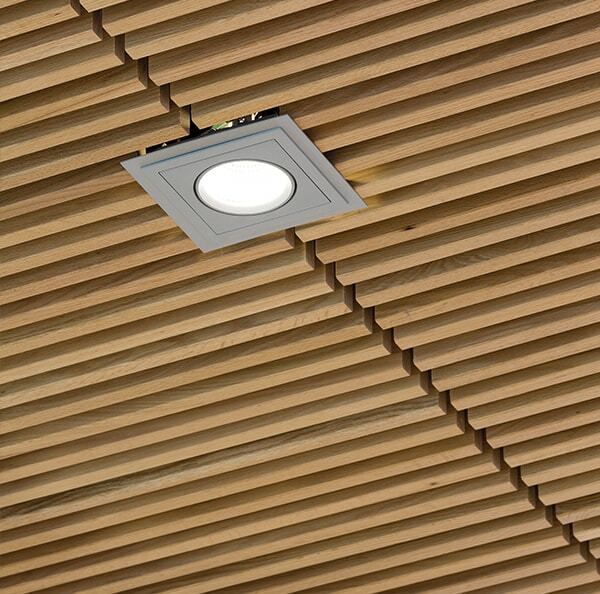 By correctly impregnating our wood ceilings with the correct fire resistant finish we are able to achieve a reaction to fire classification (EN13501-1) of B-s1,d0. For more information, please contact us. 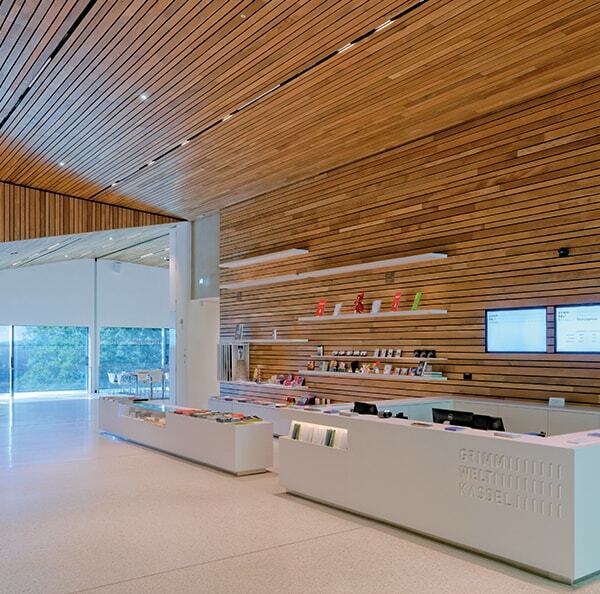 Be inspired on our project gallery with interior wood ceilings. Click on the photo for more information. Use the filters below to browse our full selection of Interior Wood Products.